A well designed commercial awning can give you the edge over your competition by making your business stand out from the rest. Since all business requirements are different from residential, Canvas Specialties custom manufactures each awning for your specific commercial awnings needs. We will fabricate the most basic traditional awning style (with or without side wings), to Curved styles such as concave or dome awnings to walkway and entrance canopies or even your own special shape and design. Our frames are welded together out of rust-free aluminum extrusions, called the staple system. The welded frame will insure that you have the strength needed to withstand year round exposure to all types of weather. The fabric awning can be any variety of materials from an acrylic fabric such as SUNBRELLA and Sattler to a laminated vinyl like Canopy & Canopy Plus and Coley all of which, when used with the staple system and tightly stretched over the frame, will give you years of service. Graphics such as names, logos and lettering can be added to your awning telling your customers who you are, and what you do. You can choose to have these awning graphics painted, or we can use adhesive lettering depending on the material you choose. 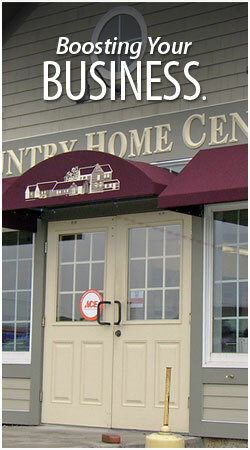 For a commercial awning that really stands out, we often use a vinyl fabric called Cooley-Brite® Lite. With this awning fabric, we add lighting mounted on the inside of the frame to illuminate your awning. This unique style of fabric allows us to use a technique in which we eradicate or eliminate the vinyl coloring in the shape of your lettering which will transform your awning into an illuminated sign.